Bible & Spade. Chap6: The Exodus from Egypt. ALTHOUGH up to the present we have found no actual archaeological evidence for the Biblical narrative, 'it is impossible to deny either the fact of the Exodus or the historicity of Moses. The main problem is, When did it all happen? The Biblical story implies that Moses waited for the death of the great Oppressor (Thothmes III) before returning to Egypt from his refuge in Midian; and that the Exodus took place almost immediately in the reign of Thothmes' successor, that is, of Amenhotep II (1448-1420). Amenhotep, therefore, was probably the 'Pharaoh of the Exodus' who hardened his heart and 'would not let them go'. He followed Thothmes in 1448 BC, which coincides with the Biblical time note dating the Exodus as 480 years before the Temple, i.e. 1447 BC. the deserted capital of the Hyksos kings. Here the colony of lepers chose a former priest of On (Heliopolis) named Osarsiph (Joseph) to be their leader. and enacted a number of laws to preserve the religious integrity of his community. and Osarsiph-Moses ruled over the whole land of Egypt for fourteen years. who afterwards became the patriarchal ancestors of Israel. Although there is obviously no historical value in this farrago of legend, we quote it as a good specimen of the kind of thing encountered immediately one seeks outside the Bible for any tradition of the Exodus. With regard to the present point, all we can claim is that possibly the tradition preserves a vague memory connecting the events of the Exodus with the name of Amenhotep. In the contemporary records of Amenhotep II, one must admit that there is no reference whatever to such national disasters as the Ten Plagues, or the loss of the Egyptian army in the Red Sea, far less to the escape of the Hebrew colonists. the Egyptians were the last people to record their misfortunes. Nor is there any sign upon the mummy of Amenhotep II, discovered in 1898 in the Valley of the Kings, to show that he was drowned at sea. The Bible indeed never states that he was, or even that he personally accompanied his horses, his chariots, and his horsemen into the water (Ex.xiv.23f). which smote all the firstborn in the land of Egypt, from the firstborn of Pharaoh that sat on his throne (Ex..29 J), ought, however, to be capable of archaeological verification. Is there any record on the monuments that the eldest son of Amenhotep II came to an untimely end? showing that Thothmes was not that sovereign's eldest son. which, on his accession, he did. which proves, since the law of primogeniture obtained in Egypt at the time? that he could not have been Amenhotep's eldest son. In other words, there is room for the explanation that the heir apparent died in the manner related in the Bible. As to the historical situation in general, there is no reason to doubt the possibility of the Exodus occurring about the beginning of the reign of Amenhotep II. The records show that on the death of the puissant Thothmes III the whole of the outlying parts of the empire broke into revolt. At the instigation of the Mitanni in the far north a rebellion against Egyptian supremacy involved the whole of Syria and Palestine. but it may well be that the distractions of this campaign early in his reign created a diversion of which Moses was not slow to make use. 'there is', in the words of T. E. Peet, 'yet nothing in the monumental evidence which throws doubt on the general credibility of the Biblical narrative. with which all other Biblical references agree. Forty may, of course, be no more than a round number, but to make the duration of the Wandering much more or much less than a generation would be to do violence to the firm tradition. We may therefore assign this interlude to the years 1447-1407 BCor thereabouts, commencing with the Exodus and ending at the latter date with the entry of Joshua into the Promised Land. Archaeologically, in the nature of the case, one can expect little additional light upon the Biblical narrative of these forty years during which the Hebrews were in hiding from the long arm of Egypt. But we can at any rate reconstruct the imperial background against which they moved. whose tomb was discovered by Carter in 1902.
but of course makes no reference to the Hebrews then lurking in the wilderness. whose reign inaugurated one of the most brilliant epochs of Egyptian history. and the great North Road through Palestine resounded to the tramp of his armies. Palestine itself was held in subjection to the Pharaoh by a system of vassal kings or chieftains, mostly Amorites, whose embattled fortresses (though weakened by previous Egyptian assault and spoliation) were held in fief to guard the roads from Bedouins and bandits, or if need be to hold the frontiers against more dangerous enemies until Egyptian reinforcements should arrive. That the Egyptian supremacy in Palestine involved more than merely military occupation is clear from the innumerable remains of a peaceful and domestic type discovered by the excavations. Scarabs of the XVIIIth Dynasty are plentiful everywhere, thus dating the discoveries. and often containing the name of the reigning Pharaoh. and that in more ways than one this influence was reciprocal. It has frequently been suggested, indeed, that Canaanite influence may have penetrated to the Court of Egypt itself through Amenhotep's wife, Queen Thi, who is said (apparently without much proof) to have been of Semitic blood. It was this Queen Thi whose parents Yuaa and Thuaa were buried in the dazzling tomb discovered, with all its treasures still intact, by T. Davies in 1905.
but are purely Egyptian in expression. Under Amenhotep, Egypt attained a peak of wealth and splendour never touched before. and his munificent endowment of the sacred Apis bulls. it was clearly useless for any invader of his frontiers to expect success. must have felt that the opportunity for claiming the Promised Land was not yet. During these forty years (c. 1447-1407 BC), therefore, we are to picture Moses building up his people into a nation in the security of the wilderness. The wandering itself probably would not last very long: he would make as directly as possible for the well-watered camping-grounds by Sinai and Kadesh, there to settle down and develop his resources in peace. The precise route of his journey thither will probably never be agreed. and excavations in the Sinaitic peninsula have failed to find any trace of the Hebrews. Petrie's excavations at Serabit-el-Khadem, it is true, have proved the existence of Semitic quarrymen and turquoise-miners in the peninsula at this time. held down to their work under Egyptian overlookers. where the cult-objects are of distinctly Semitic type? altars of incense, sacred pillars, and the like. that it was used by Moses as a pretext for visiting the peninsula? Petrie here discovered, among the interesting inscriptions described in our first chapter, a group of characters which he read as MNSHEH [It is more likely to be Manasseh.] and which some have tried to identify with the name Moses. 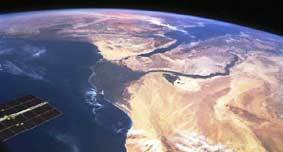 It is unlikely, however, that the route of the Exodus ever descended south into the peninsula at all. The name 'Sinaitic', and the identification of the Jebel Musa (Mount of Moses) with Mount Sinai go no farther back than the third century of our era, while the 'dotted line' showing the 'journey of the Israelites' in most of our Scripture atlases has no real authority. As a matter of fact the peninsula was probably the last hiding-place that any one would choose who was anxious to escape from Egyptian pursuit. From the days of Senerkhet of the 1st Dynasty onwards, its mines of precious stones and metals had been treasured possessions of the Pharaohs: to this day the hills of 'Sinai' are strewn with the marks of Egyptian occupation. the oldest map in the world? It is extremely unlikely, therefore, that the Israelites would dally long in a land so overrun by their enemies. not in the peninsula, but east of the Gulf of Akaba in the volcanic region of northern Arabia. There are many indications in the oldest Biblical tradition that Sinai was a volcano (e.g. Ex.xix.18 E: Mount Sinai was altogether on smoke, because the LORD descended upon it in fire: and the smoke thereof ascended as the smoke of a furnace). but in Arabia there are several. Others suggest a more northerly volcanic area near Petra. From the crater of such a volcano at the height of its activity the light could be seen for many hundreds of miles, and it has been suggested that this was the pillar of fire by night that guided Moses in a direct line from the crossing of the Red Sea to the Sacred Mount. The Land of Midian, which according to the Biblical narrative was in close contact with Sinai, must accordingly be located east of the Gulf of Akaba in Arabia, and not (as in the Scripture atlases) west of it in the peninsula. This fits in well with the Biblical narrative, where Midian is clearly in the neighbourhood of Moab and Edom? The importance of thus localizing Sinai and Midian lies in the fact that it brings us back once more to Arabia, the original motherland of the Semitic peoples and now (as it seems) the home of the Mosaic Law. Recent scholarship tends to lay far more stress on Arabian archaeology than formerly, and it is much to be desired that the country of Mohammed, so long almost closed to European explorers, should be more thoroughly excavated. [But others regard them as contemporary with the Sabaean kingdom many centuries later. in which are found many parallels to Hebrew religious beliefs and practices, going back perhaps to the days of Jethro, Moses' Midianite father-in-law. And connected (in all probability) with this Minaean civilization are the recently discovered Ras Shamra tablets which contain so many curious reminiscences of the Mosaic legislation. A rose-red city half as old as time. but the religious importance of the place may date much earlier. Phythian-Adams definitely identifies Kadesh (Kadesh-Barnea), where the Hebrews encamped on the eve of the Conquest, with this Petra, rather than with Ain Kadeis in the Negeb. In that district, he points out, there is no stream of any note, while Kadeis means simply a 'paddle', and has nothing to do with Kadesh. The very remarkable rivulet, on the other hand, which runs out of the solid rock through the narrow defile at Petra, he regards as the original of the Massah-Meribah episode (Ex.xvii.2-7 JE). The stream is still called the 'Brook of Moses' by the Arabs, and an adjoining hill is pointed out as the mount where Aaron died. in which Moses sojourned with the Midianites and where he afterwards prepared his people for their entry into Canaan. and may have renewed the half-forgotten faith of his forefathers under the influence of the mother religion of Arabia.